Alejandro Zambra's "Ways of Going Home "begins with an earthquake, seen through the eyes of an unnamed nine-year-old boy who lives in an undistinguished middleclass housing development in a suburb of Santiago, Chile. When the neighbors camp out overnight, the protagonist gets his first glimpse of Claudia, an older girl who asks him to spy on her uncle Raul. In the second section, the protagonist is the writer of the story begun in the first section. His father is a man of few words who claims to be apolitical but who quietly sympathized to what degree, the author isn't sure with the Pinochet regime. His reflections on the progress of the novel and on his own life which is strikingly similar to the life of his novel's protagonist expose the raw suture of fiction and reality. "Ways of Going Home s"witches between author and character, past and present, reflecting with melancholy and rage on the history of a nation and on a generation born too late the generation which, as the author-narrator puts it, learned to read and write while their parents became accomplices or victims. 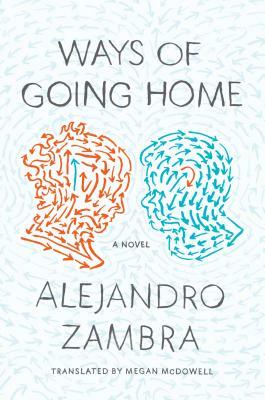 It is the most personal novel to date from Zambra, the most important Chilean author since Roberto Bolano. Alejandro Zambra is a poet, novelist, and literary critic who was born in Santiago, Chile, in 1975. He is the author of two previous novels, "The Private Lives of Trees "and "Bonsai," which was awarded a Chilean Critics Award for best novel. He was selected as one of "Granta"'s Best of Young Spanish-Language Novelists and was elected to the Bogota39 list.Megan McDowell is a literary translator living in Zurich, Switzerland. She also translated Alejandro Zambra's "The Private Lives of Trees.""